Sums Up The Movie For Me. Thor: The Dark World is a wet, cold mess. I have nothing good to say about it, so fasten your damn seatbelts, true believers — no good can come from bad. Spoilers are all around this review, so if you don’t know the plot of this film yet, try Wikipedia or IMDb. As a guy who not only adored 2011’s Thor but saw it five times in theaters and owns the Blu-ray, I got sick when I realized what I saw on a cold Thursday night in November. My biggest qualm lies in the story — it’s never focused; it twerks all over the place. The scenes on Asgard are too long and, I say with a heavy head, much too wordy. The first film got the science/magic of the story down pat because it was quick and didn’t dwell on the technical aspects, while this joint is lost in translation to Lehman’s terms. With that in mind, the writing is apalling, which is probably the result of having six writers (five of which are credited) whose ideas do not merge, but crush each other. The scenes on Asgard and Svartalfheim move much too fast and, in some cases, seem cut abruptly short, while the scenes on Earth (why bother calling it “Midgard” in this one when you didn’t use the term in movie number one?) are reduced to Fantasia-length interstitials and try too hard at being comedic. Scale is also a problem — where the first film was massive, this is too small, or at least it feels that way, given how we are rushed through these what-should-have-been massive locales. The battle in Vanaheim, for example, is so small in size and importance that I do not feel that much is at stake. In point of fact, I never felt like much was at stake for any of the characters, and because of that, I didn’t care much for them at all. Thor doesn’t change much while Jane never seems to be in much danger or care about the fact that she is marked for death thanks to the film’s MacGuffin, and the romance between the two of them seems stale and contrived. Meanwhile, Odin is too much of a king and not enough of a father to Thor and Loki — and why does he insist on leading Asgard to certain massacre after Frigga’s death? Not even the death of a loved one should completely impede the judgement of someone like him, especially when he is the one who banished Thor for restarting war with Jotunheim. There are too many problems abound — why should I care about Sif and the Warriors Three if they have no material? Why cast Zachary Levi as Fandral if he isn’t used much and we can barely catch a glimpse of his face? Where the hell is Malekith (Christopher Eccleston), the villain of the story? Was that Alice Krige as an Asgardian nurse in one scene? Why is Dr. Selvig (Stellan Skarsgård) running around naked for half of his screentime (was Lars von Trier the Second Unit Director?)? Why isn’t Sif steaming with jealousy over Thor choosing Jane over her, his childhood friend? Why is Hogun, one of two culture quota fillers in the film, shoved out so abruptly? Why does this movie feel like it was shod together in one night? Also, the subplot about paths between worlds, hinted at by Loki in the first film, are almost untouched — perhaps another casualty of rewrites? 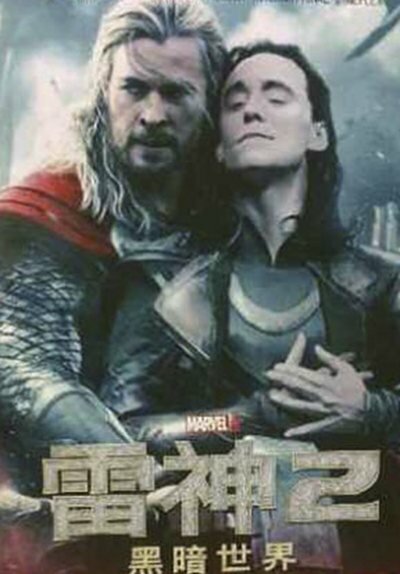 Speaking of Loki, I wonder if the creative brains behind this knew that the film is called Thor: The Dark World, not The Mischievous Misadventures of Loki, or Thor: The Dark World. Don’t get me wrong, I do love Tom Hiddleston’s acting and he has an eye for quality that I’ve not seen in any other actor… but like Captain Jack Sparrow in Pirates of the Caribbean: At World’s End, there is such a thing as too much of your favorite character, and in spite of Mr. Hiddleston’s desire to see Loki redeemed, he seems to be made up on the fly, with no defined path of character development; first he’s bad, then he’s sympathetic, then he’s bad, then he’s a hero, then he’s a dirty, lying bugger who murdered his adoptive father for a seat on the throne of Asgard. Thanos can’t come for his head fast enough. Add to this the fact that the movie feels butchered from its intended length (what should have been a two-and-a-half hour film feels sliced-and-diced into one hour and fifty-one minutes), and what you have is, as said before, a wet cold mess. Rating — 1/5. In truth, there are about five enjoyable lines; rent it from your local library.